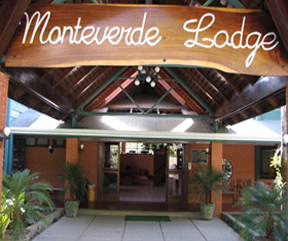 The Monteverde Lodge offers its guests a relaxing place to stay! This hotel is conveniently located next to the center of Santa Elena and the Cloud Forest, and not far from the many attractions the Monteverde area offers. Travelers will enjoy the lush gardens the hotel has to offer as well as its restaurant, bar and cozy fire place. The restaurant at the Monteverde Lodge offers both local and international dishes. In hopes to keep your stay at the lodge as environmentally friendly as possible the Monteverde Lodge uses solar panels, high efficiency lighting, water-saving fixtures and recycles. Visitors to the hotel can take advantage of the many accommodations the hotel offers including Jacuzzi, laundry and dry cleaning service, hiking trails, meeting facilities and gift shop. Guests at the Monteverde Lodge can choose to stay in one of two types of rooms. The Garden rooms offer one double bed and private bathroom. The larger Standard rooms offer two double beds and private bathroom. In either room you will enjoy the convenience of your own sitting area, coffee maker, hair dryer, solar heated water, desk and safety security box. The Garden rooms offer one double bed and private bathroom. The larger Standard rooms offer two double beds and private bathroom.